The use of electronic training devices has become increasingly widespread. In 1998 pet owners worldwide purchased more than 300,000 remote training collars, over 600,000 containment systems, and almost 600,000 bark collars. Why the popularity? These training systems have become much more affordable, and pet owners are finding them to be a safe, effective means for controlling the various behaviors that they find unacceptable. As sales of these products increase, so do the not so favorable opinions about them -- that they make dogs aggressive, that there is a greater chance of failure than success when using them, that the shock they deliver is painful, that they will result in significant injury to your pet. These can all be classified as "myths", since there is very little hard data available to prove or disprove them. However, recent studies are providing results that allow for a more reasoned analysis of this technology. Last year, one of the major manufacturers of electronic training products retained an independent laboratory to compare the level of correction produced by a pet containment system receiver to the shock produced by other common circumstances and devices. The evaluation demonstrated that the "shock" produced by a containment system is nowhere near the intensity that some people believe. These results are shown in diagram below. 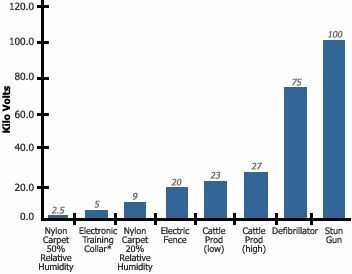 Further, this study demonstrates that the training "shock" is one-fourth the level of a cattle fence and one-twentieth the level of a stun gun, two devices to which electronic training equipment is often unfairly compared. But even this study tells only half the story. It compared the voltage put out by these devices...the intensity. You also need to consider the duration. Reputable brands of electronic training equipment correct for only a short period of time. The brand that has the UL mark of approval on its receiver features a correction that lasts only 1/40 of a second -- less time than it takes the average person to snap their fingers. But what this study does demonstrate is that not all "shock" is the same. And that the correction in question is not "painful," "powerful" or even "uncomfortable." "Surprising" maybe, but none of the above. Still, every animal will react differently to the correction. So you should always approach a training situation with caution when using this kind of equipment. As is usually the case, education is the answer. When you're training a pet, you need to have as much information as possible...and a behavior management plan to support you, as you would with traditional training techniques. When looking at selecting a product select one that provides you with both instructional manuals and videos. If you choose a product that supplies you with these necessary educational materials you will greatly increase your chances of success when attempting to improve your dog's behavior. To help demonstrate this fact let's look at a survey that was recently completed by a leading manufacturer of electronic training equipment. This company surveyed 1,025 dog owners that had been using one of three types of electronic training equipment (remote training collar, bark control collar or containment system) for a period of not less than 90 days. 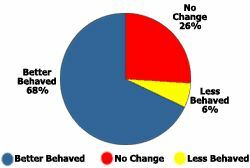 The most significant findings came as the result of asking the pet owner the following question, "Since using the electronic training product how would you describe your pet's overall behavior?" The owner was asked to respond with one of the following: a) better behaved (and specifically how), b) no change in behavior or c) worse behaved (and specifically how). The results are staggering. Slightly over 2/3 (860 of 1,025 dog owners) responded that their dogs overall behavior had in fact improved since using the electronic equipment. The graph below demonstrates the overall results. Reasons that these dogs would show an overall improvement in their behavior would include that the owners used the equipment correctly. Correct use includes spending a significant amount of time working with and socializing with your dog. When a dog receives an increase in time and attention, his behavior will usually change for the better. This survey also helps to dispel another myth about the use of electronic training equipment - that it causes dogs to act aggressive. None of the dog owners surveyed purchased the equipment for the purpose of eliminating aggressive behavior. However, approximately 12% stated that another positive side effect of using the equipment was that their dog no longer exhibited occasional aggressive behavior that had been seen in the past. Also, of those owners stating that their dogs behavior worsened in some way since using the equipment, none reported the worsening being in the form of aggressive behavior.